The Solent Slot Car Club started in March 2003. The founder members had been racing each other for some time and so it was decided to build a new permenant club track. One of the hardest things when setting up a club is finding an affordable venue, especially if you want a permanent layout. Luckily one of the racers knew of a little used room in his church. Gosport Methodist church became the home of the S.S.C.C. 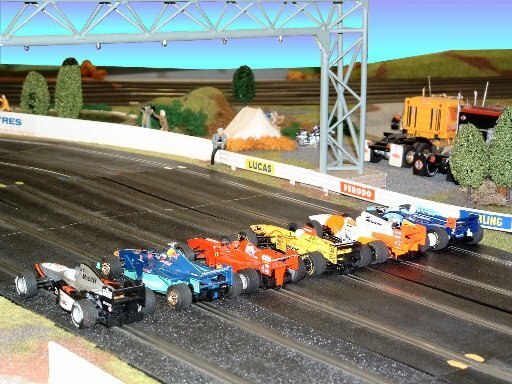 Many of us have been collecting and racing slot cars since the '60s and '70s and brought along our spare track and original Scalextric buildings. From this a 6 lane track was built complete with buildings, spectators and many intricate details. Several members of our club are electronic and software engineers and we soon had the racing under computer control. Infra LEDs can be seen on the gantry in the adjacent picture. Infrared detectors in the slot detects the car as it passes over. We race 1:32nd scale, box standard slot cars. Races tend to be either 5 or 10 laps depending on which class of car we're racing. We also run a junior club which is very popular. Once a year families at the church have children affected by the Chernobl disaster stay at their homes and the SSCC hosts races for them. The S.S.C.C. is a non profit making club.